I never liked spicy food. N-E-V-E-R! I don’t know why. In my very large family I seem to be about the only one, save my mother, who also has taste buds of a pre-schooler, with this defect. Or, perhaps it’s not a defect, but a blessing, because my face never turns red when I eat my food, I do not constantly clear my throat because the spice was too hot, I never cry (yes, I had seen that happen at least once in my life–a grown man cried because his chicken wings were too spicy), and my tender, perfectly tuned taste buds maintain their acuteness. About four years ago, however, I found Thai Kitchen Red Curry Paste, and things have changed for me. The paste is a perfect blend of spiciness I can handle, with a hint of salt for that perfect taste balance. (This post is not a plug for this product at all, I just like the stuff!) Even Sprout (my toddler) like a taste of it every now and then. 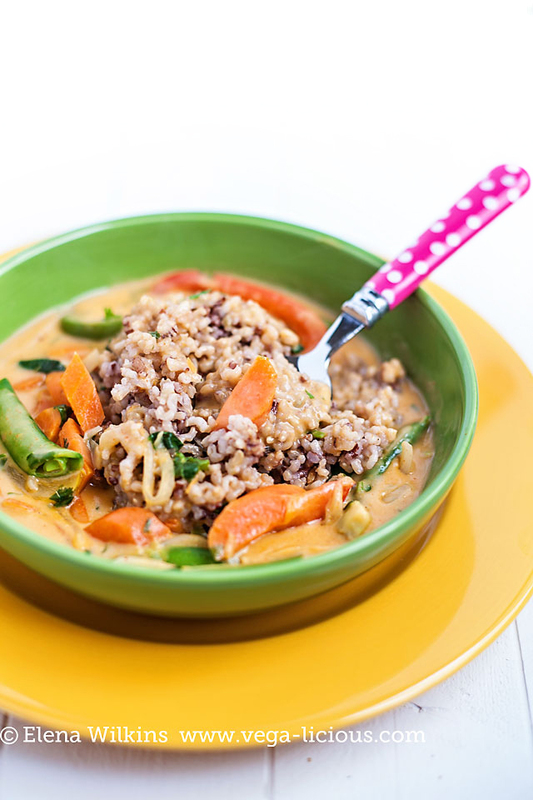 I’ve been using red curry paste in oh so many ways! You might have already fallen in love with my Cauli Poppers, which would not be possible without this paste, and my “I’ve got to get seconds” peanut sauce. 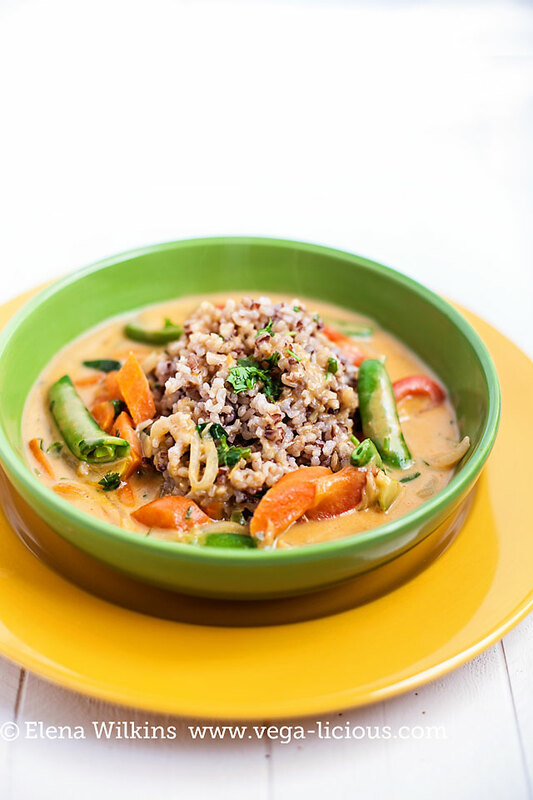 Today, I am going to add one more Thai red curry paste based recipe to your culinary arsenal that you won’t be able to live without–a 15 Minute Coconut Vegetable Curry! 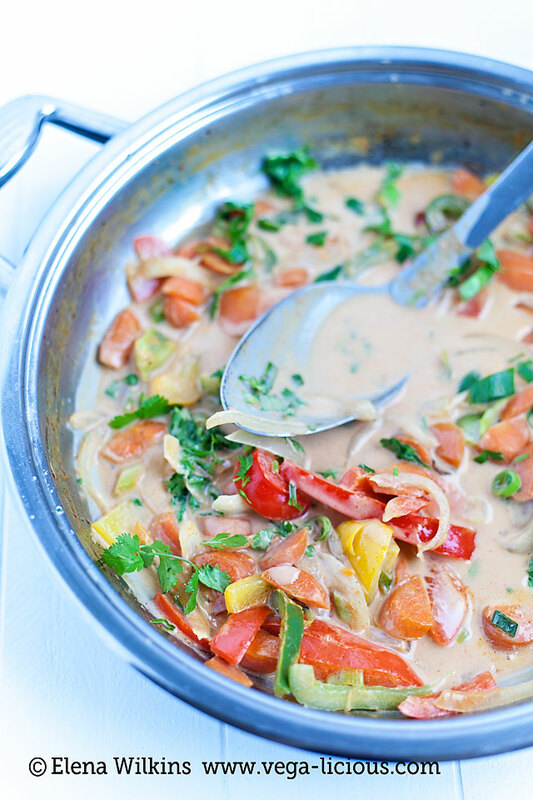 Not only is it delicious, but it’s also very easy to make, and takes almost no time at all! And I mean it! It takes me only about 10 minutes to make it. If you are a novice cook, it should not take you more than twice that time at the most, and you’ve got yourself a delicious lunch or dinner. 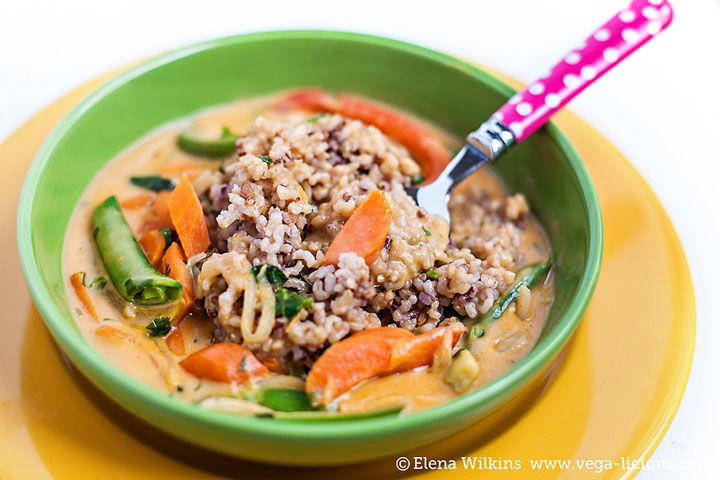 This simple vegetable coconut curry can be served over about anything–white rice, brown rice (or any other kind of other rice), noodles of your choosing, or even grains, such as quinoa. 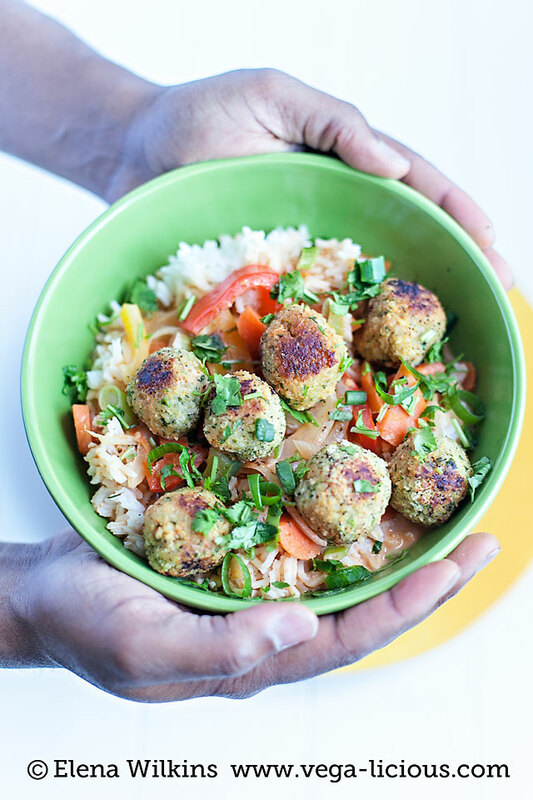 And it is perfect with the meatless meatballs I shared with you last week. Sprouted wild rice mixture I recently found at Costco and vegan meatballs combo has been my favorite so far. You can use any herb to add an extra dimension to the curry–parsley, dill, or cilantro. Cilantro has been my favorite. 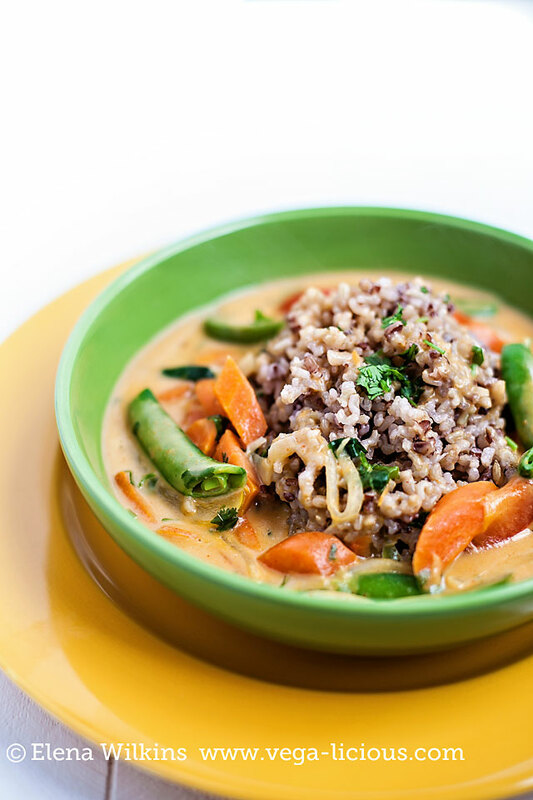 By the way, you can make it as spicy as you want–simply dial up the amount of Thai red curry paste in the recipe to get it hotter, or use less to get it milder. The recipe, as I have it, will give you the perfect happy middle of the road flavor. So, are you ready? Get your knife and skillet out, ’cause here it comes! If you like your curry a little thicker, mix 1 tbsp of corn starch with ¼ cup of water and stir into the curry once it's been cooked, right before taking it off the "fire". 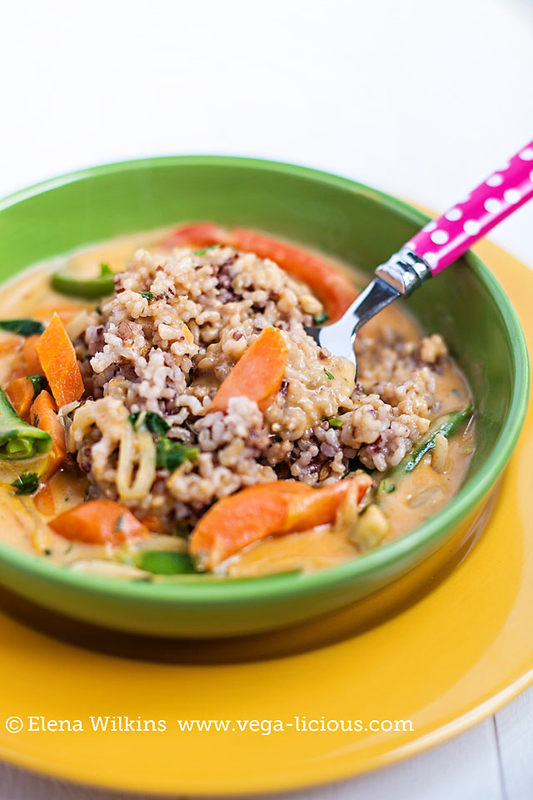 Make sure to stir curry continuously as you pour it the mixture to avoid lumps from being formed. Enjoy it. Love it. Share it! Oh, yes, and Pin it!